You must make your own lodging and transportation arrangements. These accommodations are located in Stevensville, Michigan, which is the closest area to the conference. Note: Details subject to change. 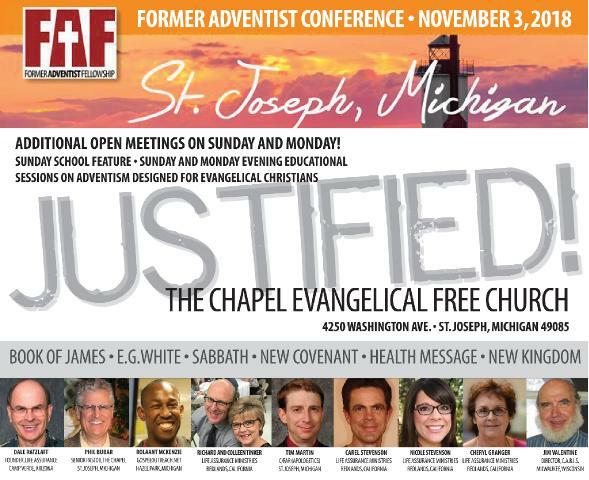 10:00 am – Dale Ratzlaff: Does James Teach Justification by Works? 2:00 pm – Tim Martin: Is the Sabbath for Christians? Colleen Tinker: Transferred to His Kingdom! Richard Tinker: Why Do Adventists Leave? You must register to attend the Saturday sessions. Registration includes two meals, snacks, and handouts on Saturday. The Sunday and Monday sessions are public meetings and the community is encouraged to attend at no charge! *Cost includes all sessions, session handouts, free stuff, lunch, dinner, and snacks on Saturday. Scholarships are available. Call for more information. Phone 1-909-794-9804 for more information or registration by phone.